Moving internationally can be an intimidating process regardless of where you are moving overseas. You have to take many factors into consideration including dates and time frames, budgets, travel arrangements, packing and wrapping...the list goes on. Luckily, for those moving overseas from New Jersey or the tri state area, you are located right next to the largest container moving port on the east coast. That means a shorter pickup/dropoff distance than for someone relocating from the middle of the country, as well as more options as long as you use an experienced international moving service. Fortunately, our company is located in Elizabeth, New Jersey just a few minutes from the harbor: so from the very beginning, packing, wrapping and loading are done by our team of professionals. We'll even come to your residence and our movers will take care of the rest, no third party services needed! Furthermore, we're proud members of IAM(International Association of Movers), AMSA, IATA and are a fully licensed and recognized company. You can learn more about our accreditations by clicking the logos at the bottom of the page! For all our overseas shipping destinations, we offer a few different options depending on each clients specific budgetary and volume needs, as well as required time frame. No matter what you are shipping, our team is professionally trained and our process is based on years of experience. Being an international moving company in New Jersey with our own crew and warehouse gives us the ability to provide first class service both across the state and locally. 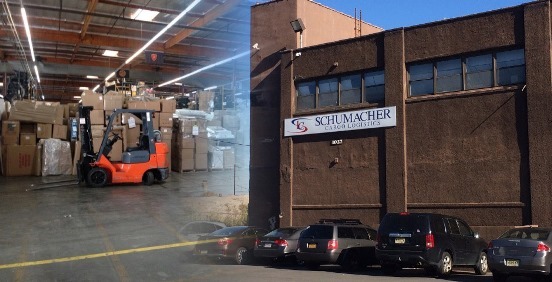 Depending on the service you select, Schumacher Cargo will arrange to pack and wrap your goods professionally from the comfort of your own home. However, if you wish to pack your items yourself, we can deliver a container to your residence and then retrieve it for delivery to the docks or clients can deliver their household goods to our warehouse. This of course depends on how much you need to ship. For some, it may be more practical to drop of the items yourself if you live in Elizabeth or nearby Newark, for others moving a 4 bedroom home for instance, using our in-house packing and wrapping service or having your own container delivered may be better suited. No matter where you are, we have affordable moving options to more than 60 worldwide destinations. We know that there are millions of options for individuals relocating internationally from New Jersey but we've been helping people move from the area since 1977. The local perspective combined with our international shipping experience gives us an edge. Additionally, we are not brokers and deal directly with our clients using our own warehouse, pickup and delivery crews. Our warehouse is located just 20 minutes away from two of the largest international shipping ports on the east coast..
We are located just 6 minutes from Newark Liberty International Airport, 25 minutes from Jersey City and Hoboken, and within an hour drive of Princeton and Trenton. Under most circumstances, if you are moving overseas from New Jersey with household goods to popular destinations in Europe, the Middle East, Scandinavia, etc., your personal effects will be directed through our office in Elizabeth. 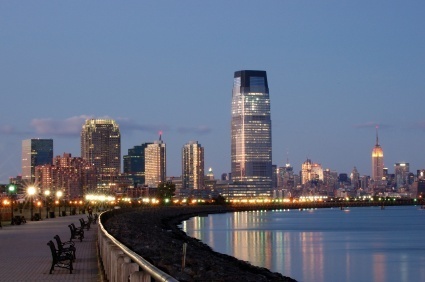 How Long Does it Take to Move Overseas from New Jersey? As international movers, we've developed relationships and have specific contracts with the major shipping lines for our own direct groupage rates. This means more competitive rates and services leaving on a regular basis to all the top international destinations. As New Jersey is our primary departure location on the east coast and it's closer to the major markets in Europe and other countries across the Atlantic, shipment times will of course be shorter. Generally from New Jersey to Europe it takes around 2 weeks on the ocean and then depending on the final destination you select and the type of service you use, we could have you moved door to door in as little as 6 weeks. As, you'd expect, these are rough guidelines and the amount of time it actually takes can vary due to other factors but we'll be happy to go over everything. So give us a call today or fill out our quick quote form to get your estimate today.